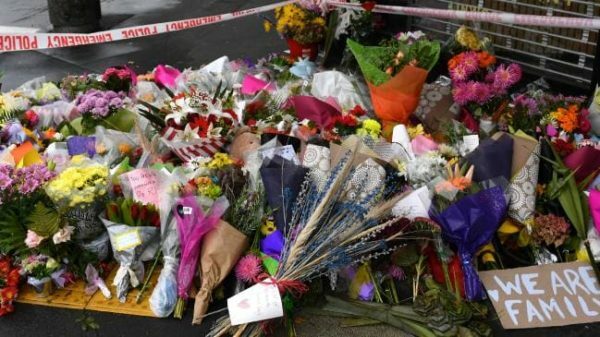 A survivor of the Christchurch massacre has described how a heroic worshipper at one of the targeted mosques seized an empty rifle discarded by alleged gunman Brenton Tarrant and then used it to chase their attacker away. Alabi Lateef said he was praying with others inside Linwood Masjid, the second mosque attacked on Friday by self-confessed white supremacist Tarrant, when he heard the sound of gunfire. “Straight away I stopped my prayer, I peek through the window and I found a person with, you know, machine gun and heavy dress,” he told news website Stuff. Alabi said he told worshippers to duck down and then described how he and a “brother” decided to confront the attacker during a lull in the gunfire. The pair noticed Tarrant had left the spent rifle on the ground as he returned towards his car. So Lateef’s unnamed fellow worshipper seized the initiative and grabbed the rifle, following the attacker to his car and using it to smash the vehicle’s back window before running away. The pair’s actions may have saved further casualties, as Tarrant was apprehended by two armed police officers not far from Linwood mosque soon afterwards while driving his car with a visibly smashed back window. Tarrant used Facebook to live broadcast his initial assault on the Noor Mosque, where at least 40 worshippers were murdered and dozens more wounded. In that opening attack, footage from his broadcast showed Tarrant mercilessly spraying bullets inside the mosque and then returning to his car to fetch a new rifle. He then walked back inside and started shooting again. Footage from the attack also shows at least one worshipper at the Noor Mosque who was gunned down while trying to charge Tarrant during his rampage. Lateef was photographed soon after the attack by local media wearing a grey shalwar kameez tunic that was covered in blood. He told Stuff that as soon as the attacker had left he ran back inside the mosque to help those who had been shot. “I’m very sad for what has happened but I believe this country is a peaceful country and I hope something good will happen after this,” he said, fighting back tears.